Before I post about the workshops, I couldn't wait to show and share this new stitchable motto design I'm listing in my Etsy shop. I think it will be especially darling for wedding, graduation and baby gifts. Love the message and the colors. 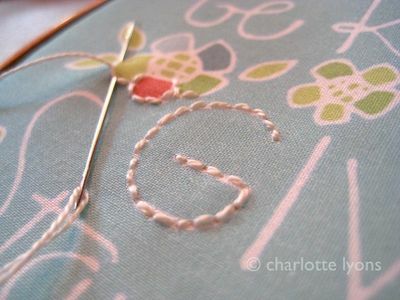 I'm just stitching over the white lines with white thread and back stitch. And then I'll make it into a pillow. Think I can finish in time for the wedding we're attending this weekend? 4 nights. Bet I can!